In my tiny corner of the world, there’s not much better than a great Bloody Mary. And don’t get me wrong, I love the taste of one, but even more so, I love the Bloody Mary environment and culture, if you will (does that statement make me sound uncultured?). The hours-long brunch with nothing else to do and nowhere else to be. The long pause and “hmmmmm” and “sure, why not” to the waitress when she sees that your glass is getting low. There’s just nothing else like it—a boozy brunch with friends or lovers or, hell, strangers even. Like ALL human beings, I once couldn’t stomach the taste of a Bloody (let alone tomato juice by itself), but those dark days are thankfully far, far behind me. I’m now quite the aficionado, and a rather judgmental one at that, because here’s the thing: bad Bloody Marys are everywhere. They are an epidemic that is ruining brunches everywhere and damning people’s ideas of what a Bloody is forever. Here’s what I do not want: a glass of tomato juice with vodka in it; a glass of cocktail sauce with vodka in it; a glass of vodka with tomato juice in it. Here’s what I LOVE: any variety of Bloody Mary that has layer upon layer of flavor and spice—so much going on that you forget you’re drinking tomato juice; a Bloody Mary with 1000 bites of things on a skewer where you just keep taking sip after bite after sip to quench all the feels of ladies-(or gents)-who-brunch day. The next obvious, rational, logical step is to recreate my idea of the perfect Bloody Mary Bar at home to be enjoyed by any and all who share the same love and desires and life goals as me. Although it may look intimidating—make no mistake, this is mostly things that you already have in your fridge, or could very easily pick up at the store, thrown into assorted cups, bowls, and plates and laid out on a big table or other surface. The only thing that really needs to be prepped ahead of time is the Bloody Mary mix, which speaking of, can be made the day before and refrigerated to let the flavors develop and fester. The mix is delicious as is, but can be spiced up in a number of ways by anyone looking for more heat, more salt, more citrus, more horseradish, etc. 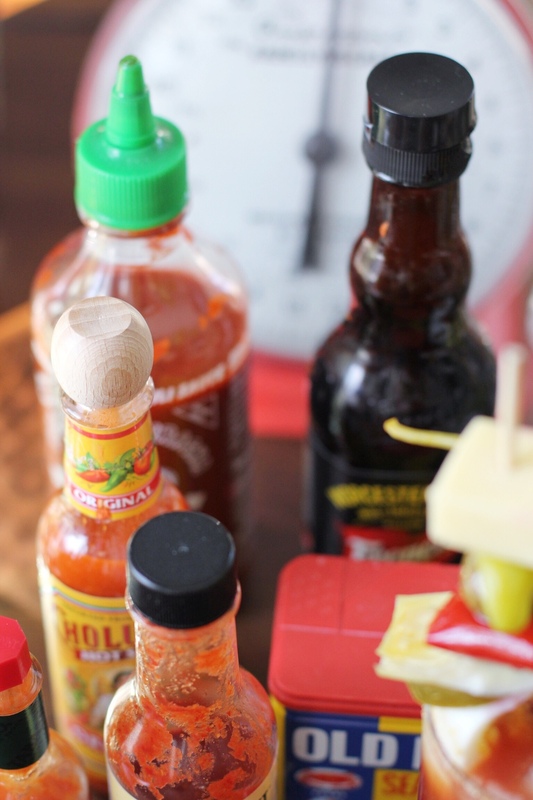 because those are all add-ins that will be part of the make-it-yourself Bloody Mary Bar. PS: Thanks, Janess, for my cutest "Bloody Mary" stick! Mix all ingredients well in a large pitcher, and taste for seasoning. Then pour it back into the tomato juice bottle for easy storing. Make at least 8 hours in advance to let flavors develop in the fridge before serving. As you can see from the photo above, this is the general order of the bar setup, and the way I'd encourage people to get after it: Glasses first, then citrus wedges and salt rim plates (have to do this step before adding anything to the glass—sounds obvious but everyone, myself included, messes this up). Then an ice bucket (and good straws if you'd like—I went without). Then the bottles of liquor. Then the mix, add-ins, and seasonings. Then wood skewers (cut down to size) and all the toppings. However, there are no rules here, and you should go hog wild setting up your Bloody Mary Bar however your heart desires. 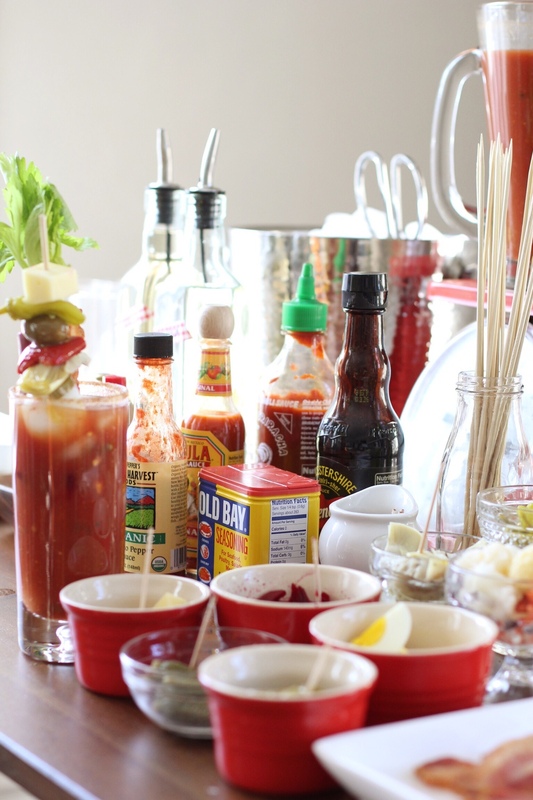 But if you'd like some further guidance, below you will find anything and everything you'd need to know for building a bangin' Bloody Mary Bar at home. Mix each salt, and put in separate dishes or plates. Serve alongside lemon and lime wedges for rubbing on the rim of the glass to wet it so the salt mixture sticks. 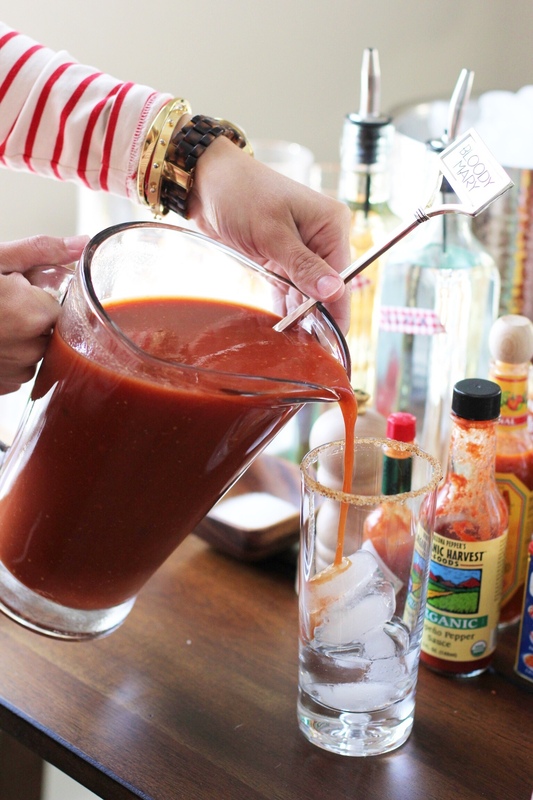 Do you have any secrets for making a great Bloody? I'd seriously love to know. Cheers to Sunday Funday or, even better, Saturday brunch!